Many people won’t go camping without a shower and toilet inside the camper. 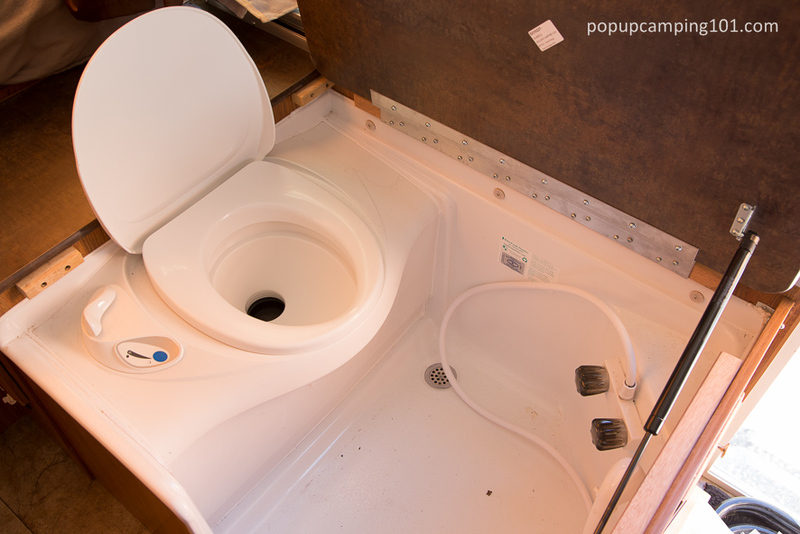 Here are the pros and cons of including a bathroom inside your popup camper. As I predicted, we’ve never used the shower in the traditional sense. We camp exclusively in the backcountry with no hookups. Our popup has the largest freshwater tank capacity offered by the manufacturer at 20 gallons. Most people use about 25 gallons per shower. 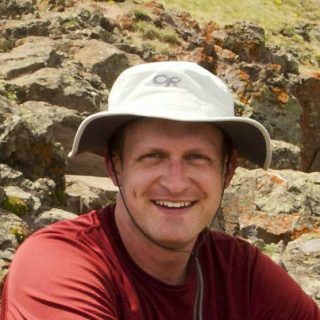 A compromise to this problem is the “navy shower,” which can use as little as 2 – 4 gallons of water for my wife’s showering needs. 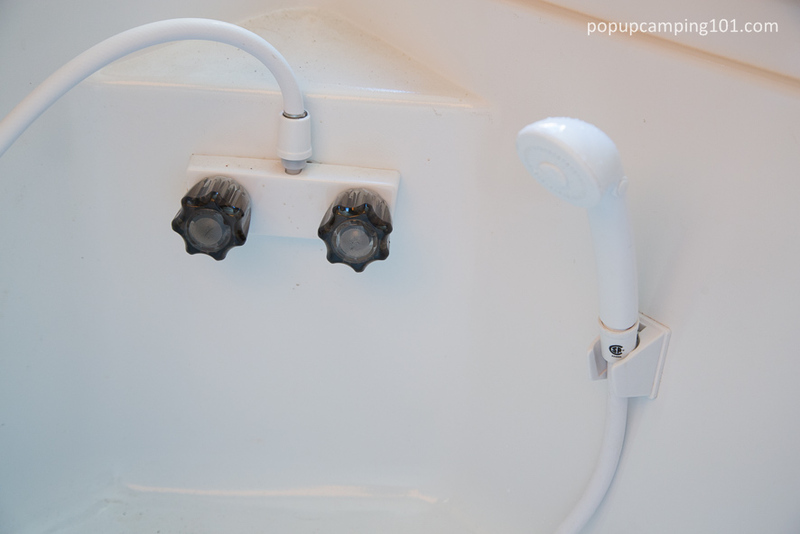 The shower and tub basin has also proven very useful for washing feet or other spot areas during longer trips. If you camp in campgrounds with water – either full hookups or even a spigot you can use to refil the popup’s water tank…you should have no problem taking a “normal shower” – especially given the availability of hot water (see below). 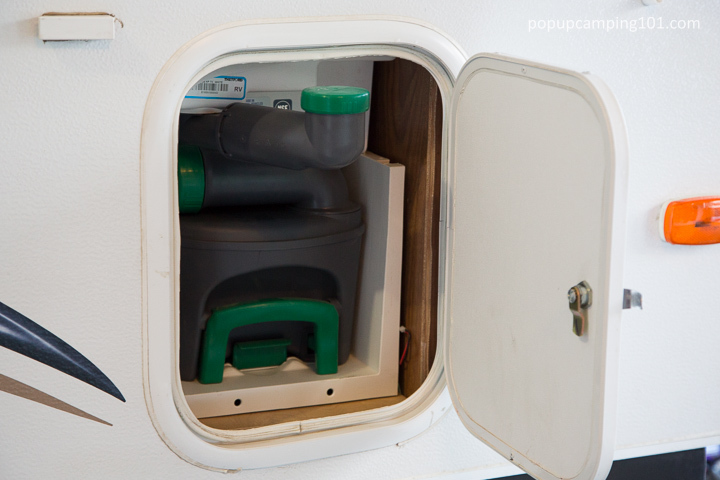 Some popup campers come with a water heater also installed. For ours, it provides hot water to the sink faucet, inside shower, and outside shower. 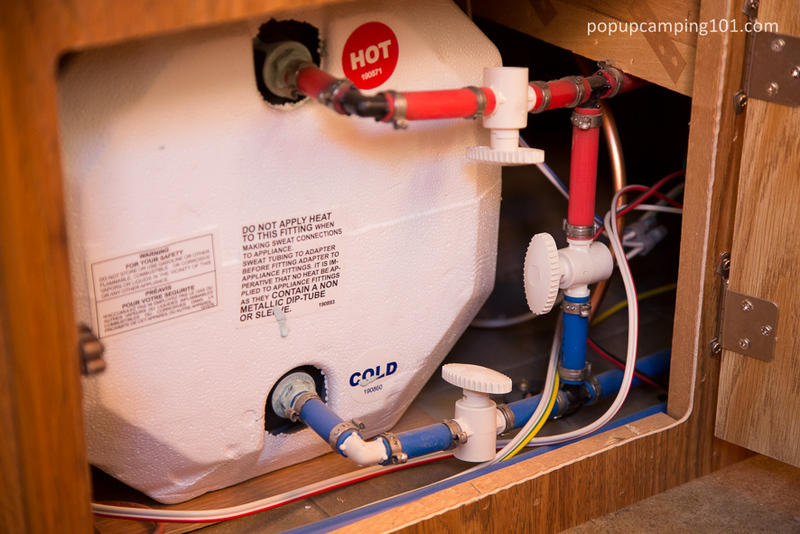 Here’s the inside view of the water heater, which is wrapped in Styrofoam for efficiency. 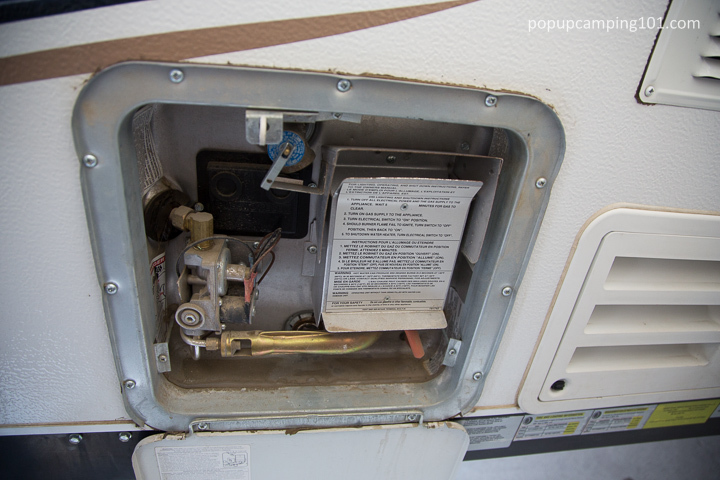 I’ve got my bypass valves shut to disable the use of the water heater in the picture above, since it was taken after I winterized the camper. Ours has an electronic ignition system that automatically fires up the LP-powered flam when the water needs heated and then shuts it off when done. This is extremely convenient. And here’s the outside of the water heater for servicing and water draining (including for winterization). Our popup camper has a combination shower / toilet setup. 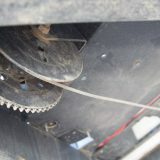 Cassette toilet means you empty the waste by removing a cassette from the exterior side of the camper, as shown above. That said, we’ve never used the toilet either. The idea of sleeping that close to human waste hasn’t been attractive. EDIT (and this is huge): I totally take back the paragraph above. One night a few years ago, someone (not me, but shall otherwise remain nameless) needed to use the bathroom in an emergency, and going outside wasn’t an option during a heavy rainstorm. So, we used the toilet for the first time and never looked back. Eating my words above, it has been simply wonderful. No stink if you properly use the chemicals and treat it with Thetford sealant about once or twice a year. 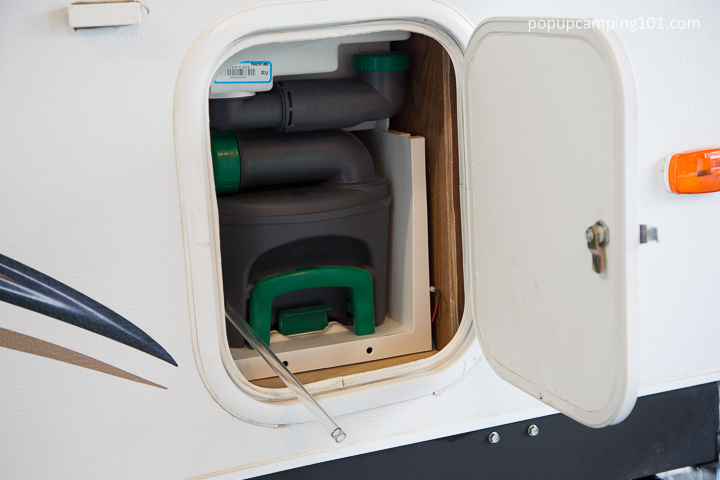 Disposal is quite easy – simply wheeling it into a vault toilet or even your bathroom at home, extending the dump hose, and then pushing a button to release a vent valve and it all drains out. When done, I put a bit of clean water in, add another dose of chemicals, and install back in the camper. 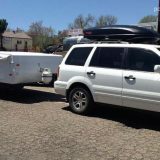 The use of a toilet has been especially beneficial after we moved to the American Southwest, where a lot of desert and shoreline camping along the Colorado River is done without a vault toilet or other bathroom option within a 30-minute drive. The Thetford model is filled by swiveling out a pipe and pouring in the water which will be used during a flush. A small tube stands upright when in use and indicates when the water level is full. You pull this tube out to drain the water from the system (including for winterization). Where to buy the shower combo tray like yours? 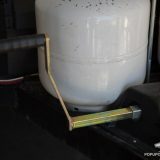 This is something that comes pre-installed in a camper and would be quite difficult to install aftermarket. That said, it’s from Thetford (Europe). 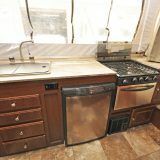 This was very helpful as I am considering getting a popup camper, but have been looking for one with a bathroom option. I’m wondering if there is a way to increase water storage on these campers? You can technically swap out an existing freshwater tank for a larger one, assuming the new one fits betweeen floor joist bays int he frame. 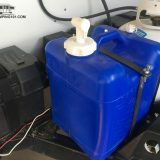 For additional toilet water capacity, just bring along a seperate water container (and even mount it to the camper frame like http://www.popupcamping101.com/water-container-carrier/) plus extra waste cassette (https://www.amazon.com/Thetford-33206-Left-Holding-Tank/dp/B009E2TIYE/). Where does the shower and sink gray water go? 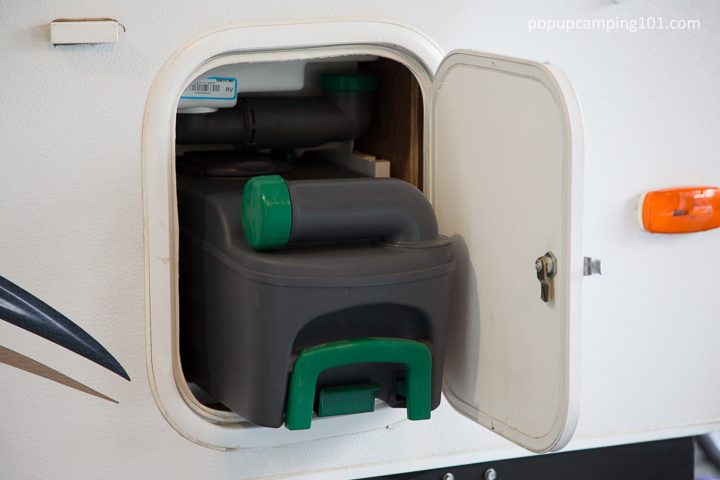 You can get various portable gray water collection tanks (some with wheels) to not just dump it straight into the environment, which shouldn’t be done unless you’re using biodegradable soap etc.